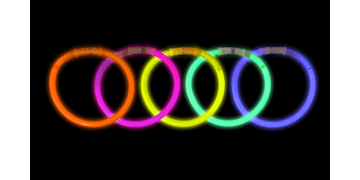 Glow sticks and glow bands are low-cost, fun party accessories, that are popular at concerts, discos and bars. Our glow sticks and wristbands are high-quality and offer a long lasting bright glow. To use them, bend it and shake and the band will become luminious within a few seconds. Order now for your upcoming event with fast UK delivery starting from 24 hours!